IMGT/DomainGapAlign is part of IMGT®, the international ImMunoGeneTics information system®, the high-quality integrated information system specialized in immunoglobulins (IG), T cell receptors (TR), major histocompatibility complex (MH) of human and other vertebrates species, immunoglobulin superfamily (IgSF), MHC superfamily (MhcSF) and related proteins of the immune system (RPI), created in 1989 by Marie-Paule Lefranc (Laboratoire d'ImmunoGénétique Moléculaire, LIGM, Université Montpellier II and CNRS) and on the Web since July 1995. 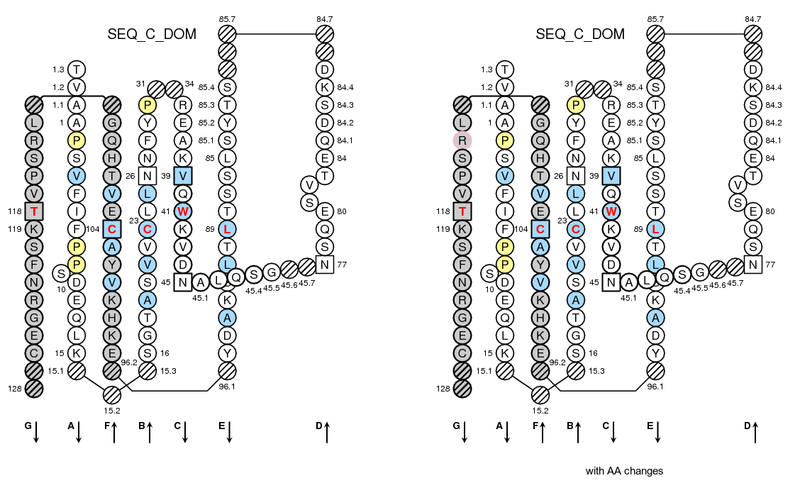 IMGT/DomainGapAlign is a tool which analyses amino acid sequences per domain. to create gaps in your amino acid sequence, according to the IMGT unique numbering, for V-REGION or C-DOMAIN. to align your own amino acid sequence with the IMGT domain directory and to identify the closest germline V-REGION or the closest C-DOMAIN. to obtain the IMGT Collier de Perles of your V-REGION (V-DOMAIN, see below) or C-DOMAIN by clicking on the name (in green) of your sequence in the Alignment. Select 'V' for sequences of the variable domains of heavy and light chains. Select 'C' for sequences of the constant domains of heavy and light chains. 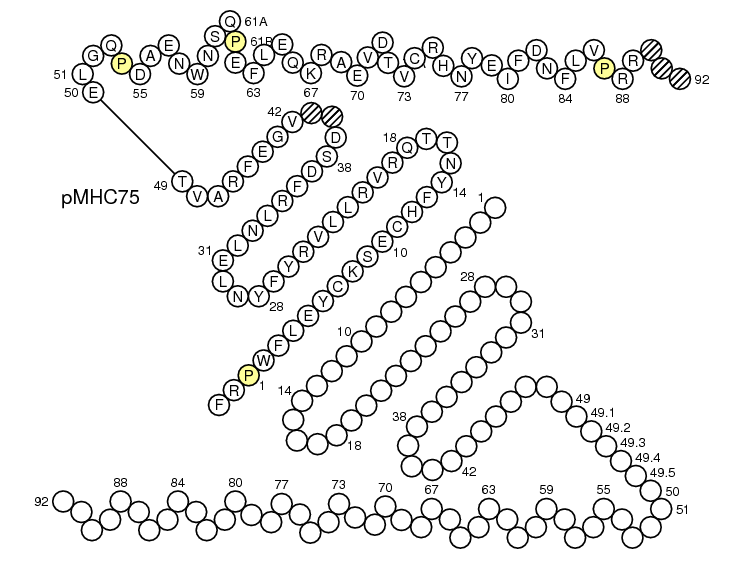 To delimit the domains (CH1, CH2, CH3) of the heavy chains, an easy way is to check with IMGT Alignments of alleles (in IMGT Repertoire). In IMGT, the 'domain type' concept has three main concepts: the V type (V for variable), the C type (C for constant) and the G type (G for groove). 'V type' identifies the domain type of domains described as V-DOMAIN and V-LIKE-DOMAIN. 'C type' identifies the domain type of domains described as C-DOMAIN and C-LIKE-DOMAIN. 'G type' identifies the domain type of domains described as G-DOMAIN and G-LIKE-DOMAIN. Select the species in the drop-down list. Select the minimum or maximum Smith-Waterman score for the alignments to display (For example, choosing a "Smith-Waterman score above 200" will provide and display alignments whose Smith-Waterman score is superior to 200). Select the number of alignments to display (Displayed alignments) and tick off the checkbox if you want to display IMGT Colliers de Perles. V: V-ALPHA, V-BETA, V-DELTA, V-GAMMA, V-KAPPA, V-LAMBDA, V-LIKE. 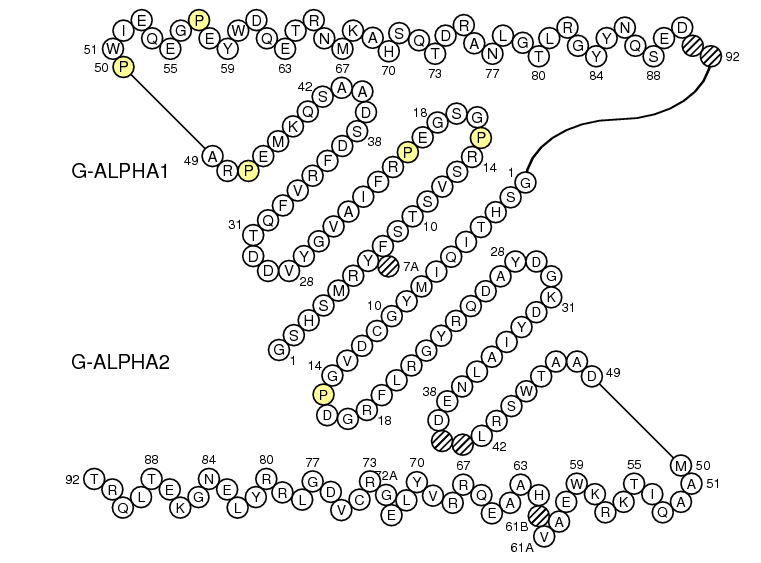 G: G-ALPHA, G-ALPHA1, G-ALPHA1-LIKE, G-ALPHA2, G-ALPHA2-LIKE, G-BETA. C: C-ALPHA, C-BETA-1, C-BETA-2, C-DELTA, C-GAMMA-1, C-GAMMA-2, C-GAMMA-3, C-GAMMA-4, C-GAMMA-5, C-GAMMA-6, C-KAPPA, C-LAMBDA, C-LIKE. 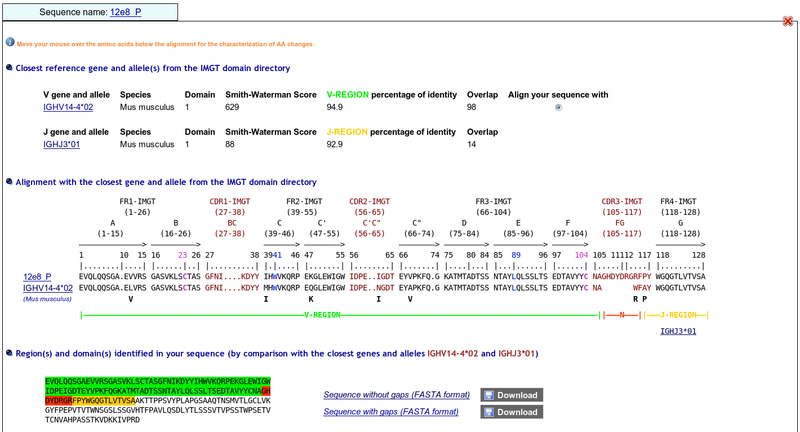 IMGT/DomainGapAlign identifies the closest germline V-REGION (for 'V') and the closest C-DOMAIN (for 'C').The IMGT gene and allele name of the closest sequence(s) from the IMGT reference directory is (are) provided with a percentage of identity. 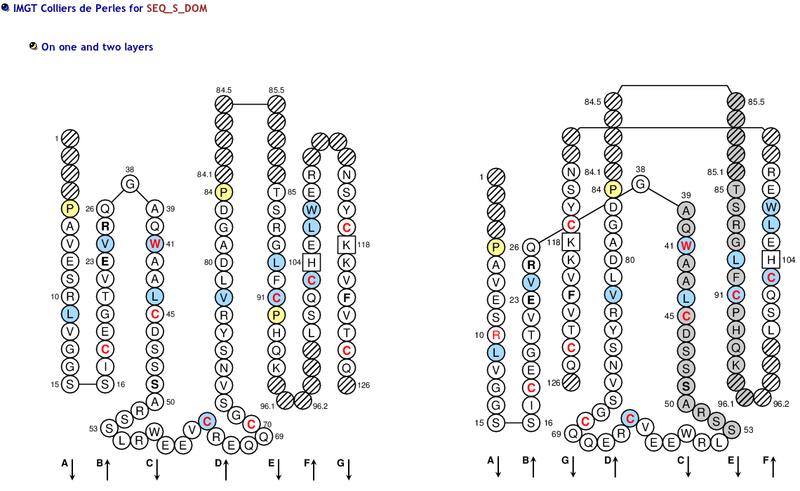 IMGT/DomainGapAlign displays your amino acid sequences with IMGT gaps and, for 'V', with delimitations of the FR-IMGT and CDR-IMGT, according to the IMGT unique numbering for V-REGION and V-DOMAIN , and for 'C', with delimitation of the strand and loops, according to the IMGT unique numbering for C-DOMAIN . Amino acids in bold represent differences between the closest germline V-REGION (for 'V') or C-DOMAIN (for 'C) and the sequences submitted by users. 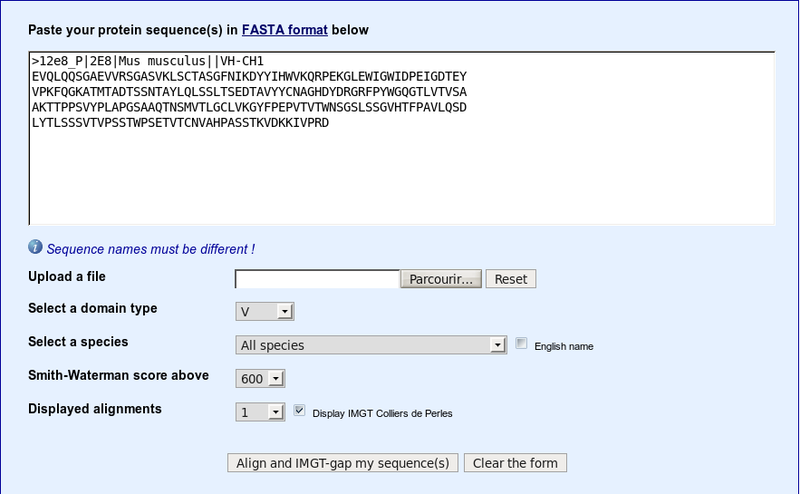 IMGT/DomainGapAlign displays your amino acid sequences with IMGT color menu for domains and regions, according to the IMGT Scientific chart. 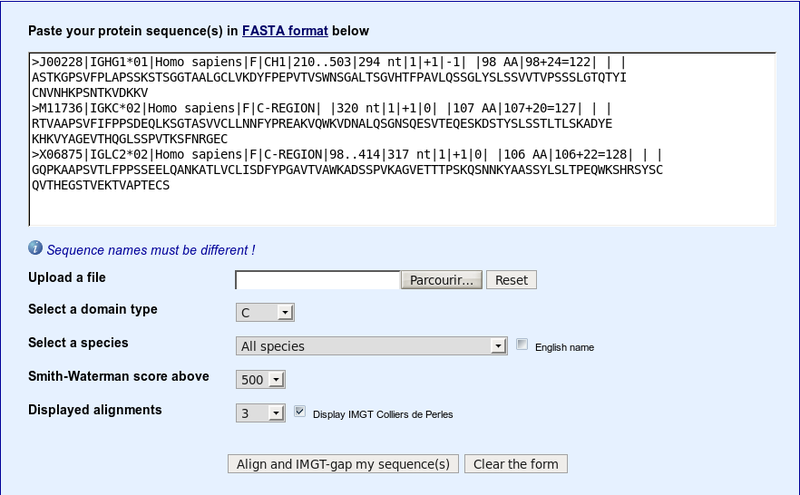 You can display or download your amino acid sequences with or without gaps. 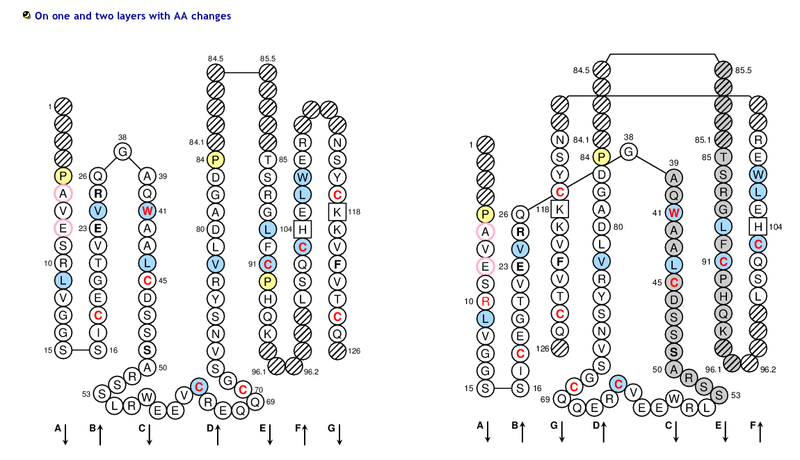 The AA changes are shown in strands and loops and in FR- and CDR-IMGT. IMGT Collier de Perles, on one and two layers, with amino acids changes are generated (complete Collier de Perles, comprising CDR3-IMGT and FR4-IMGT). - For (IGK,IGL,TRA,TRG), CDR-IMGT regions are colored as follows: CDR1-IMGT (blue), CDR2-IMGT (green) and CDR3-IMGT (greenblue). - For (RPI,IGH,TRB,TRD), CDR-IMGT regions are colored as follows: CDR1-IMGT (red), CDR2-IMGT (orange) and CDR3-IMGT (purple). - 50% Hydrophobic positions: These positions shown in blue correspond to hydrophobic amino acids (hydropathy index with positive value) and Tryptophan (W) found at a given position in more than 50% of analysed IG and TR sequences. 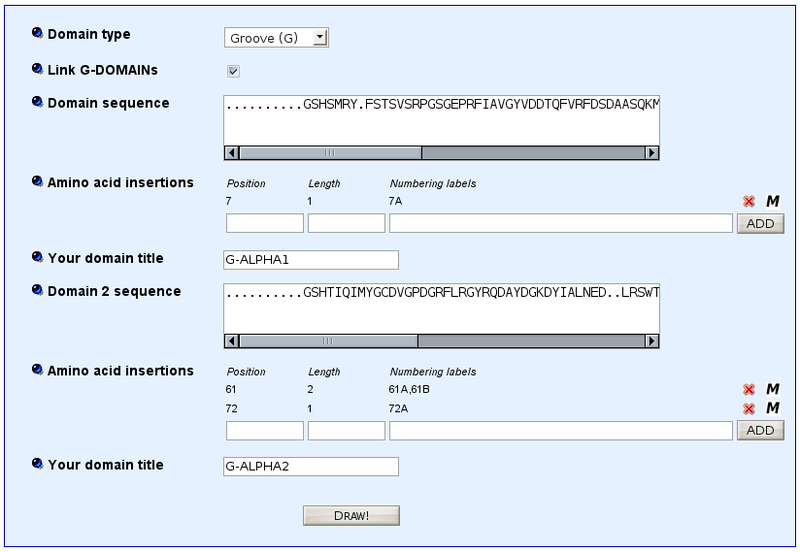 - In the Domain sequence window, seize your gaped sequence with the CDR3 and the J amino acids (at least 9 or 10 amino acids beyond the F or W, of the motif F/WGXG respectively, to get the complete J. 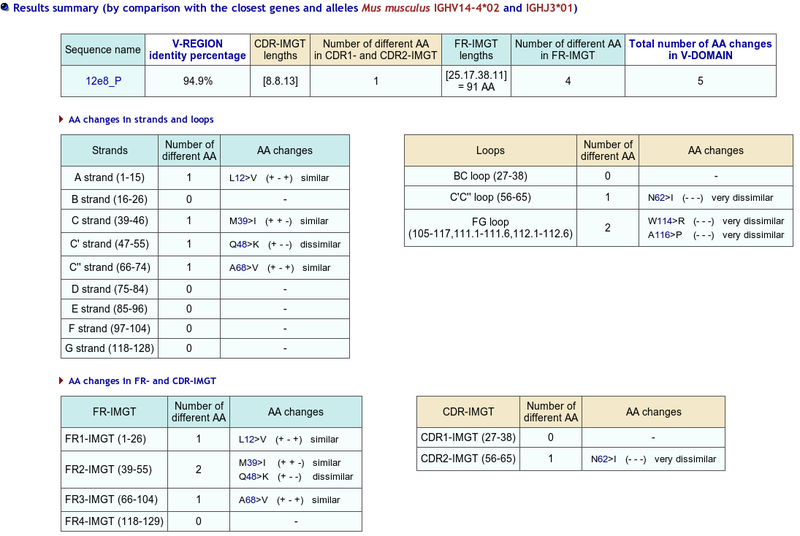 See Alignments of Alleles for the IGHJ, IGKJ and IGLJ in IMGT Repertoire. - add gaps in the CDR3-IMGT. If the CDR3-IMGT is <13 amino acid see IMGT unique numbering for V-DOMAIN and V-LIKE-DOMAIN. 4) In "Your domain title" box (optional), type a clone name (that you would like to be displayed in the figure). 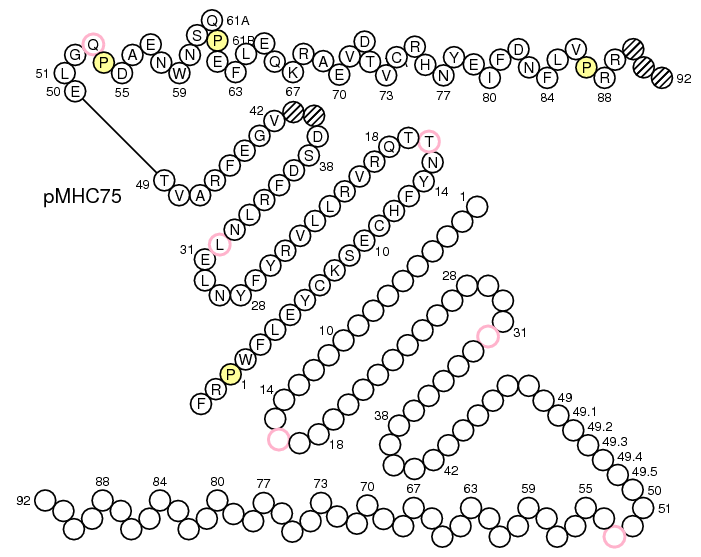 For normal IG and TR domains, you do not need to use the "Amino acid insertions" boxes. These boxes allow to deal with IgSF V-LIKE-DOMAIN and C-LIKE-DOMAIN which have amino acid insertions compared to the IG and TR domains. IMGT Collier de Perles, on one and two layers, with amino acids changes are generated (complete Collier de Perles). IMGT Collier de Perles, on one and two layers, with amino acids changes are generated. Before using IMGT/Colliers-de-Perles for G-domain, align your sequences against the human ones using IMGT/DomainGapAlign to be sure to localize the gaps at the right positions (including the gaps at the beginning of the sequences). 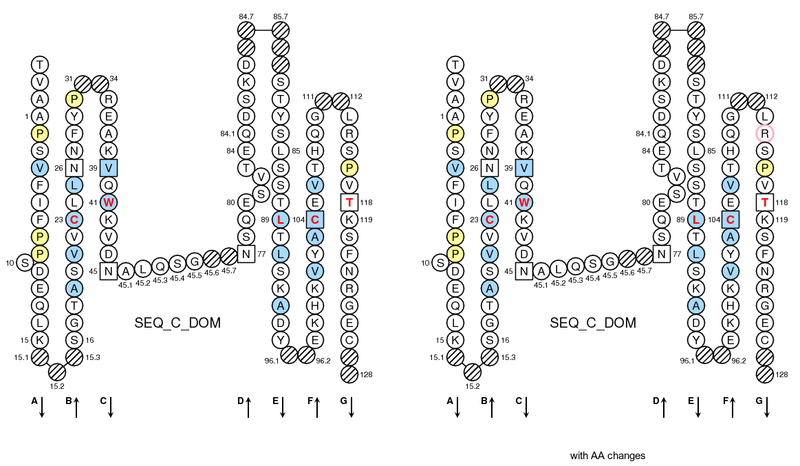 Note that IMGT/DomainGapAlign provide more sequences, but be aware that in these alignments the numbering includes gaps for MH1, MH2 and RPI-MH1Like like comparison. In Make Your Own IMGT Collier de Perles page (IMGT/Collier-de-Perles), select Domain type: Groove(G). For MH1, click 'Link G-DOMAINs'. 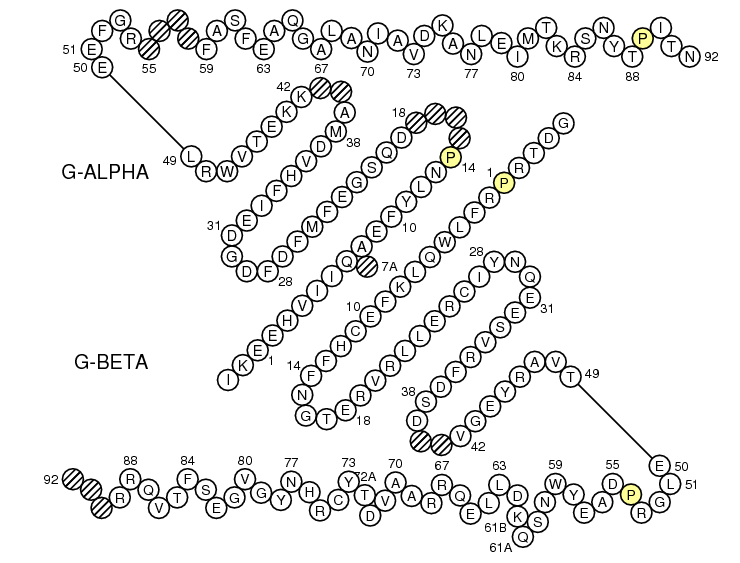 Paste in the 'Domain 1 sequence' window the sequence of G-ALPHA1 (for MH1) or G-ALPHA (for MH2). 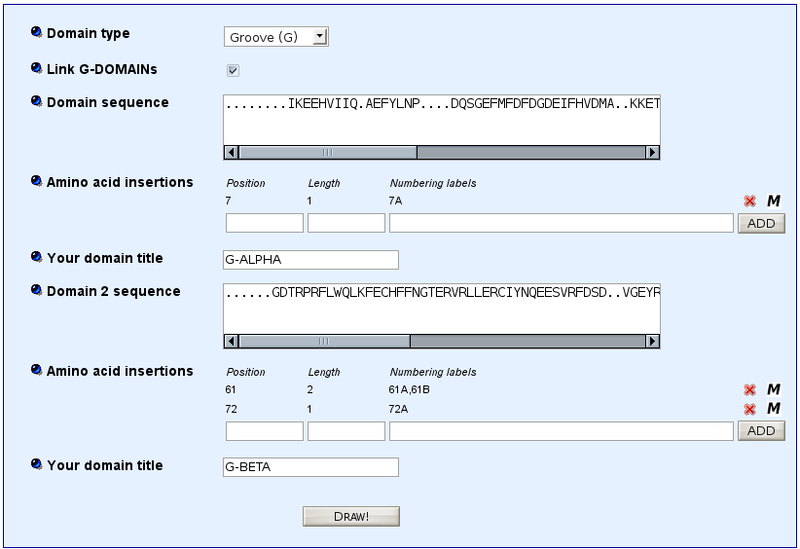 Paste in the 'Domain 2 sequence' window the sequence of G-ALPHA2 (for MH1) or G-BETA (for MH2). Lefranc, M.-P., WHO-IUIS Nomenclature Subcommittee for Immunoglobulins and T cell receptors report, Dev. Comp. Immunol. (in press).